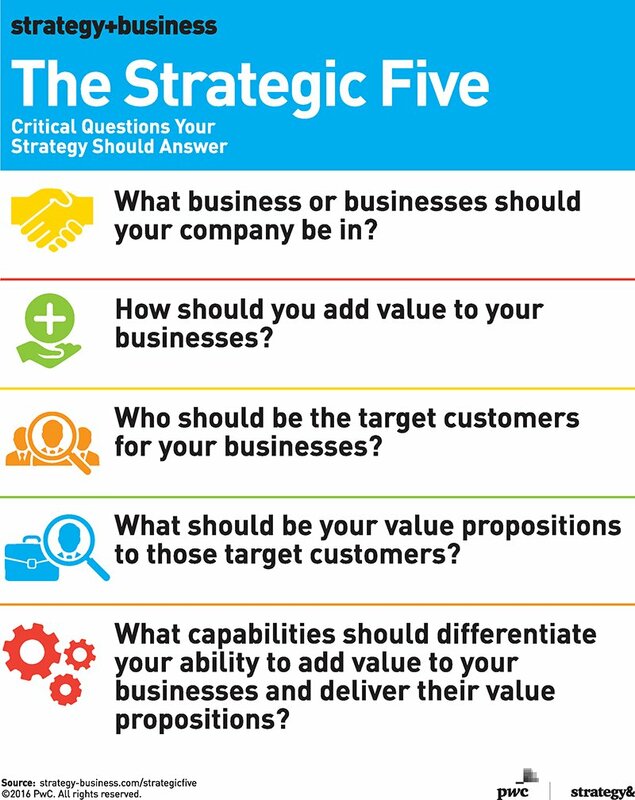 Ken Favaro, contributing editor of Strategy+Business, has a good article today about the key questions that every strategy should answer. Here are Favaro's five crucial questions. How Fearful is Your Organization? • An absence of frank and open dialogue. For example, when important conversations happen either before or after meetings, but everyone remains silent during the official discussion. • A resistance to participate, for fear of being ridiculed, overlooked or “shot down”. • Only notional alignment (“lip-service”) on action plans, underpinned by a collective belief that those plans will be ineffective anyway. • A partial or total reluctance to pass any bad news upwards. • A focus on salient but unlikely catastrophic outcomes. Does your organization have these characteristics? Are senior leaders aware of the climate of fear that they have created? The opposite climate, on the other hand, is a climate of candor. In those climates, people talk openly about problems and issues, and they are not afraid to share bad news. Those types of cultures not only help senior leaders spot hidden risks, but they also promote creativity and innovation because people do not fear being labeled a failure. What is Yahoo? What is Every Firm's Toughest and Most Important Question? “If you’re everything, you’re kind of nothing,” said Brad Garlinghouse, a former Yahoo executive who in 2006 wrote the “Peanut Butter Manifesto,” an internal memo criticizing the company for spreading itself too thin. “The sad reality…is it never solved its core identity crisis.” Mr. Garlinghouse said Yahoo’s fluctuating strategies often confused employees. He recalled asking managers at a retreat in 2006 the first word they thought of when he named a company. Google, eBay and others yielded clear answers—“search” or “auction.” Yahoo didn’t. Managers said “mail,” “news,” “search,” and other things. Does your firm have a good answer to this question? Can you define your organization's purpose/mission in a simple sentence? Marc Gobe, author of Emotional Branding, puts it slightly differently, but he gets at the same issue. He asks: Can you tweet your brand promise? In other words, can you express your core pledge to your customers in 140 characters or less? FedEx can do it: "Absolutely, positively overnight." Ritz Carlton can do it as well: "Ladies and gentlemen serving ladies and gentlemen." What was Yahoo's brand promise? It's hard to find a way to describe its pledge to its customers in 140 characters or less. In the end, the lack of a clear identity led to its demise, and it hurts many other firms as well. Building on the recent blog post about social influence, here's Jonah Berger himself talking about his research. Building on the last blog post, check out this National Geographic video about social influence. When Do Others Help Us Make Better Decisions, and When Does the Influence of Others Hurt Us? We find that contrary to conventional wisdom, search through social networks typically results in job offers with lower total compensation (-17 percent for referrals through strong ties and -16 percent for referrals via weak ties vs. formal search). However, our models also show that students are considerably more likely to accept offers derived via weak ties. They do so because they are perceived to have greater growth potential and other non-pecuniary value. On balance, our tests are consistent with Granovetter’s argument that networks provide value by facilitating access to information that is otherwise difficult to obtain, rather than providing greater pecuniary compensation. Judah Pollack and Olivia Fox Cabane have written an interesting article for Fast Company about how to become a better listener. Pollack and Cabane explain how our mind works while we are listening to others. They argue that we "mentalize" while we listen. Here's their description of this important, but perhaps highly flawed, sense-making process. When we listen, we don’t just hear a person’s words, we try and put those words into context. Neuroscientists call this "mentalizing," the ability to understand another person’s internal motivations and desires. When we hear a person’s words, we also try to imagine why they're saying them. And some of us do this more successfully than others. What's the problem? Well, when we mentalize, we often make assumptions about others. A variety of factors may shape those assumptions (our own beliefs about a subject, the appearance of others, the other party's background or prior statements, etc.). Unfortunately, those assumptions may not always be correct. The other party may be motivated by something quite different than we have presumed. If we are incorrect about their motivations, then we may miss vital information that the other party is trying to convey, or we might misinterpret something that they have said. How do we become better listeners? First, we have to question our assumptions about others. Ask yourself: What am I presuming about the other party's motivations and desires? How might I interpret their statements differently if my assumptions are incorrect? Second, we have to engage in thoughtful inquiry. We have to ask non-threatening questions to try to unearth and understand the other party's goals, interests, and desires. Tim Harford writes a great column (The Undercover Economist) for the Financial Times. This weekend's essay is titled, "Brexit and the Power of Wishful Thinking." He derives an important lesson from the widespread Brexit analysis about the way we adhere to our preexisting beliefs. Harford begins by describing an experimental study conducted by Guy Mayraz. In this research, Mayraz asks research subjects to predict the future price of wheat. He first provides participants with 3 months worth of historical wheat price data. He informs the subjects that they will be paid based on the accuracy of their forecasts. Mayraz assigns 1/2 of the participants to play the role of a farmer, while the other 1/2 of the subjects play the role of the baker. What happens? According to Harford, "Nearly two-thirds of farmers predicted higher-than-average prices, and nearly two-thirds of bakers predicted lower-than-average prices. People tended to predict that their dreams would come true." Harford then draws a connection to the Brexit situation. He argues that Remain supporters engaged in rampant wishful thinking leading up to the vote by they British public. People tended to forecast that their dreams would come true, rather than looking objectively at the situation. Similarly, Harford argues that many people have displayed confirmation bias in their post-vote analysis. He counts himself as one of the culprits. Harford explains that he looked at the drop in the value of the pound and the decrease in the FTSE 100 index as support for his preexisting view that Brexit would have a painful impact on the UK economy. On the other hand, he dismissed the subsequent stock market rebound because it did not support his position. "I accepted bad news when it chimed with my beliefs, and dismissed good news when it did not." What should we do about this wishful thinking and confirmation bias? Harford advocates for scenario planning rather than to construct single forecasts. Harford writes, "Because scenarios are persuasive stories, they can help us face up to uncomfortable prospects and think clearly about possibilities we would rather ignore. And because scenarios contradict each other, they force us to acknowledge that, in the end, we cannot actually see into the future." "Starting Friday, annual bonuses for thousands of senior managers will be tied more directly to the performance of each leader’s specific business unit instead of being based on the company’s broader, regional operations. “We are trying to get a clearer line of sight between an individual’s responsibilities and their results and their compensation,” Chief Financial Officer Jon Moeller said this week in an interview. P&G has been trying to reduce bureaucracy, give managers more autonomy to make key decisions for their units, and hold people more accountable for results. This compensation system change fits with those other efforts. You should not tie compensation more directly to a specific unit's performance unless you provide the unit manager with a sufficient level of autonomy to make important decisions. We should keep in mind, however, that no compensation system is perfect. Diversified firms, in particular, always face a tension between tying compensation to local unit performance vs. the results of large segments or even the corporation as a whole. One the one hand, you want people to realize the benefits of managing their units effectively. On the other hand, related diversifiers such as P&G want managers to cooperate with the heads of other units so as to realize important synergies. The risk of this latest move for P&G is that managers may become too parochial, not thinking enough about how to collaborate with other units to achieve economies of scope.